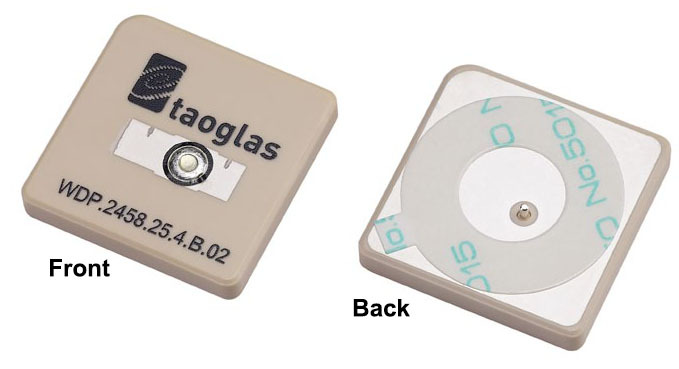 This unique patent pending high gain, high efficiency embedded ceramic patch antenna is designed for professional Wi-Fi dual-band IEEE 802.11 applications. It is mounted via pin and double-sided adhesive. The passive patch offers stable high gain response from 4 dBi to 6dBi on the 2.4GHz band and from 5dBi to 8dBi on the 5 ~6 GHz band. Efficiency values are impressive also across the bands with on average 60%+. The WDP.25�s high gain, high efficiency performance is the perfect solution for directional dual-band WiFi application which need long range but which want to use small compact embedded antennas. The much higher gain and efficiency of the WDP.25 over smaller less efficient more omni-directional chip antennas (these typically have no more than 2dBi gain, 30% efficiencies) means it can deliver much longer range over a wide sector. The WDP patch antenna has two distinct linear polarizations, on the 2.4 and 5GHz bands, increasing isolation between bands.